142 West 2nd Street – Pioneer George Pierce; board farmhouse c.1868, wings early 20th Century. 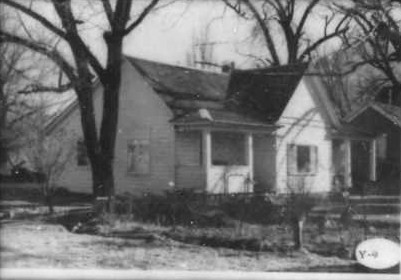 George Pierce Home circa 1868, wings added circa 1900; photo Ogden Call Survey, 1986. George Pierce Home; photo 2007. Original two-room boarded house with entrance on the long side; c. 1868. In about 1868 George Pierce built a two room frame house that measured 27 by 14 feet. The exterior walls were board; the inner walls were made of adobe bricks secured between red pine studs and covered with a lime plaster. 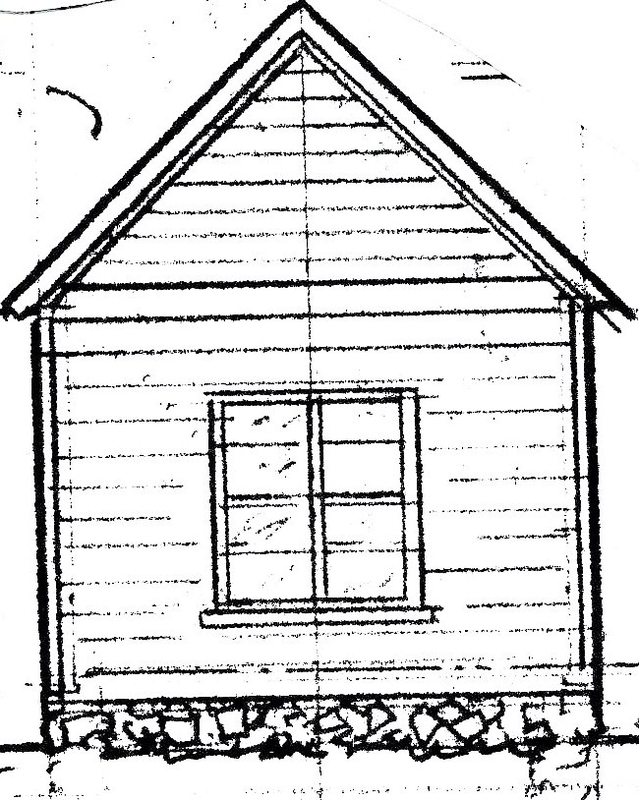 (See photo below) The house had a cedar fir floor, a rock foundation and a brick chimney. The entrance was on the long side. These qualities in house building were a step up from the surrounding log cabins. This arrangement with an entrance on the long side is called a half cross-wing and is considered a “starter” plan. Builders of this type planned to construct a perpendicular wing in the future as time and money allowed. Usually the wing was added so that the floor plan resembled either a “T” or an “L”. About 1900 an unknown builder finished the house in a “T” plan making it a cross-wing. 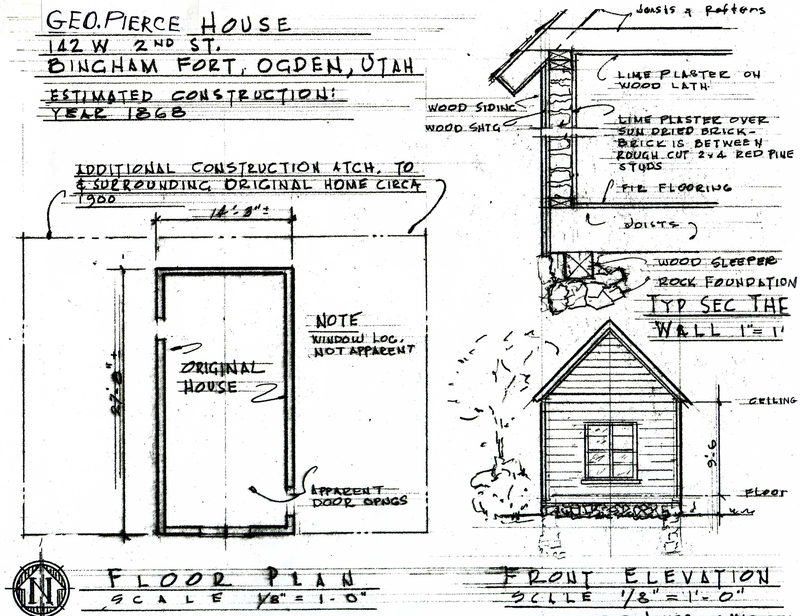 In 2001 Gordon Q. Jones, author of Pioneer Forts in Ogden Utah, analyzed the construction of the original house and made the following drawings. It is interesting to note that the third school house, the Hutchens house and the Gillson house were built at the same time in a similar fashion with inner adobe walls covered with lime plaster. 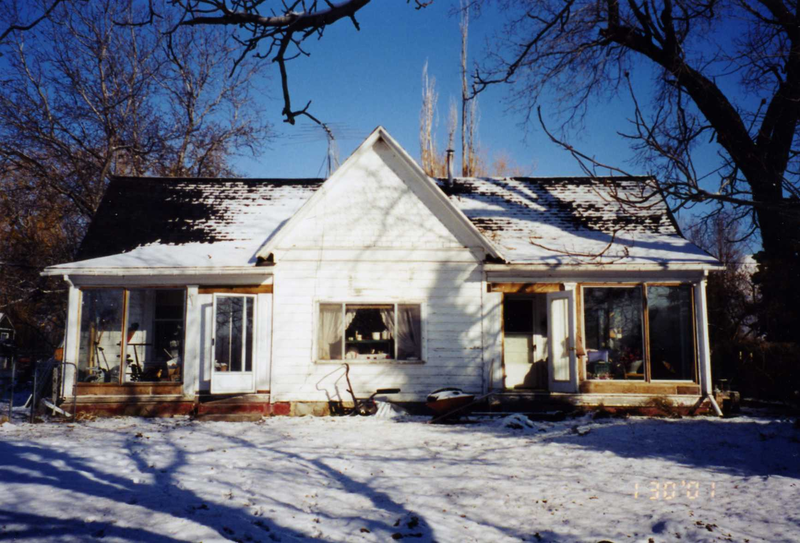 This style of home building showed the settlers desires for improved homes and reflected the establishment of a lime kiln in Ogden Canyon. Drawings by Gordon Q. Jones in 2001. 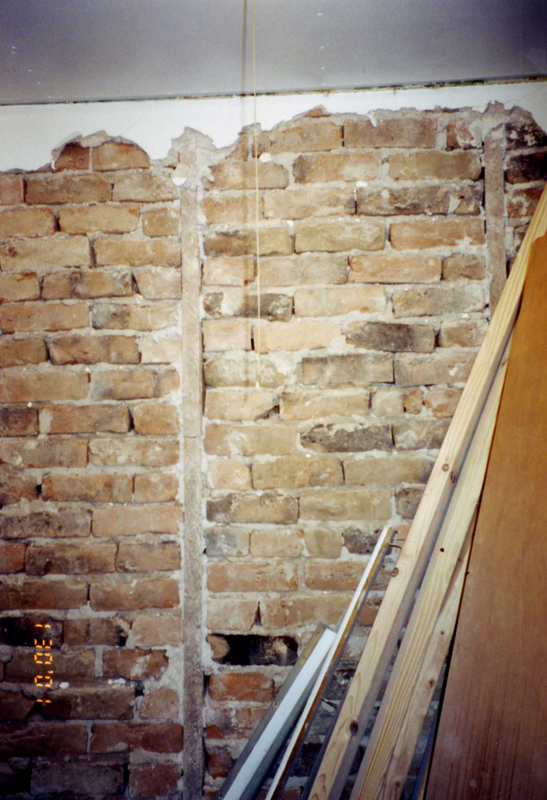 Interior wall of original house was red pine studding lined with adobes covered with lime plaster; photo 2001. About Jane’s family: Francis Romrell (Romeril) and his wife, Mary Billot, their daughter Jane and other children came from the Isle of Jersey in the English Channel. They spoke both French and English. In 1849 they embraced the gospel taught to them by Mormon missionaries, Elders Dunbar and John Taylor who became the third president of the Church of Jesus Christ of Latter-day Saints in 1880. John Taylor was imprisoned in France and through Mary’s influence and tact a goodly sum of money was raised and used as an aid in releasing him from prison. The Romrell family immigrated in 1855 to Bingham’s Fort with the half sister of Francis, Mary Langlois, her husband Samuel Langlois and their children. Francis was 56 years old when they arrived. Their son, George Romrell, lingered in St. Louis and did not arrive until 1861. Bingham’s Fort disbanded in 1856-1857, and the Romrells were among those who remained on 2nd Street and made a permanent home in the fort. Francis’ farm was 10 acres; he was also a shoemaker and his wife served as a midwife. 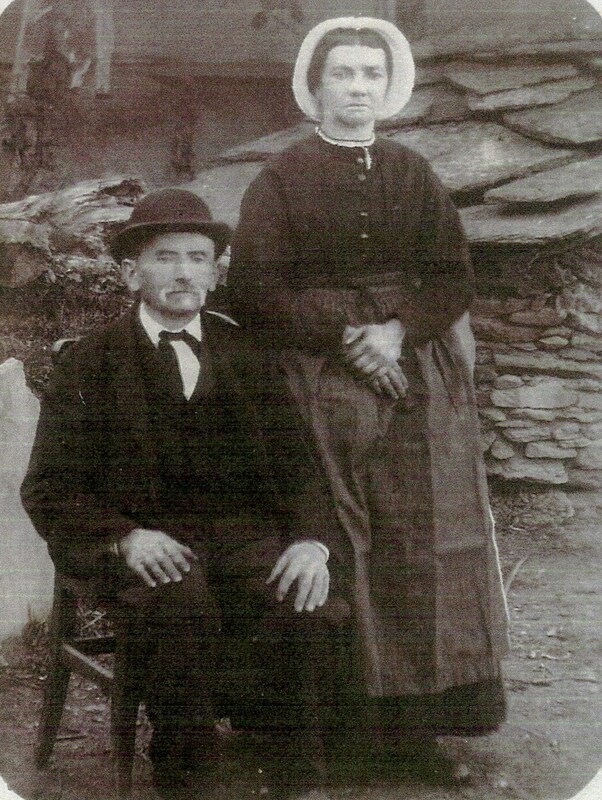 Shortly after Mary Romrell’s death in 1866, Jane Romrell and her husband, George Pierce, moved to the farm to help her father. Jane’s sister, Fanny Romrell Ducloux, returned to 2nd Street in Feb. 1874 from Alabama after the death of her husband, Maurice Ducloux (see home page and history, 1859 and 1874). Fanny had endured trials of the Civil War and was glad to return to the Saints, join the Lynne branch and sing in the choir. Her father and family welcomed Fanny back into their home and also her children and her husband’s step-father, Pa Pierre. Fanny was eager to adhere to the general counsel of the Church and teach her children the principles of the gospel. It was a happy reunion. Francis Romrell died in 1875. George and Jane had eight children and would soon find it necessary to build a larger home next door. Jane made their surroundings beautiful with flowers and trees and sold produce from her garden. The Indians taught her the medicinal value of herbs. After George and Jane died, members of the Baptista Maero family lived in this house from 1925 to 1991. 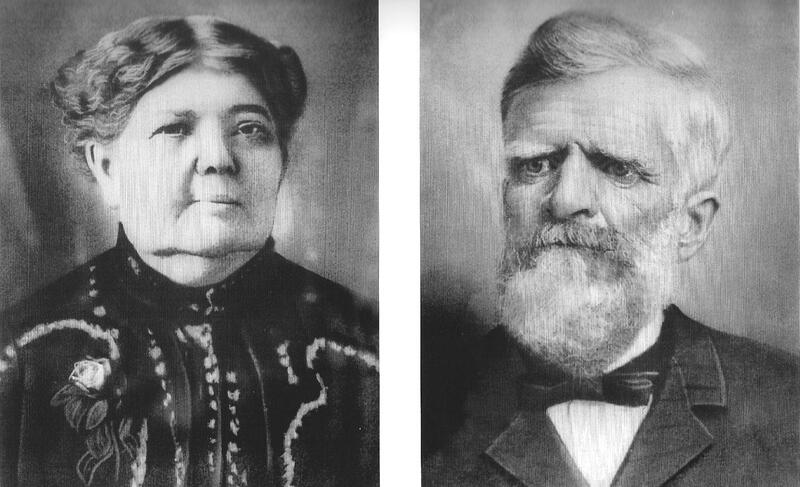 Baptista and Mary Bertinoti Maero immigrated from Italy in 1896. Thomas Carter and Peter Goss, Utah’s Historic Architecture, 1847-1940, 1988, Utah Historical Society, p. 37-43. Jane Romeril Hammond Pierce, Daughters of Utah Pioneers, Vol. 34, p. 56, Ogden DUP Museum, Ogden, Utah. Francois Romeril and Progenitors, manuscript, in possession of Parley Oleson. Ogden Standard Examiner, 1934, Bingham’s Fort, Built to Guard Against Indians, Is Remembered by Subscriber, Fred Pierce interview. Daughters of Utah Pioneers, Pioneer Women of Faith and Fortitude, p. 2399.